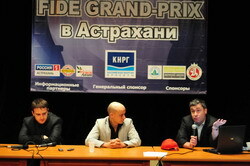 After 4th round games grandmasters came to the press office and answered to the journalist’s questions. Dmitry Jakovenko: Evgeny selected the variation I didn’t know well. After the game he told me that the usual move is 13.Nс4, not 13.Nе4. I allowed trading Black’s bishop for the knight because I thought my position is better there, but apparently I was wrong, because after a few moves I started to think I’m worse. Not sure about the plan with 20.g4 and 21.g5, perhaps it was better to trade the knights and make a draw. Soon I started to worry about my weak pawns... In the end we began to repeat the moves. Of course I could advance my pawns – f4, e4, but I didn’t see how to proceed, while Black has a clear play. So, I decided that my risk is higher than the reward. Evgeny Alekseev: The opponent surprised me with his 6th and especially 13th move. I had a good game, but the position was hard to play for both sides. In the end I was short on time and didn’t see any real way to play for a win. Question: You know each other for quite a while, do you? Alekseev: Yes; we played our first game in the under-16 championship, more than 10 years ago. The score is in Dmitry’s favor so far. Peter Svidler: Miracles of my home preparation continued! The position before Black’s 9th move was analyzed during the preparation. In the morning I came across the 9...Qа5 idea, but, as usual, did not look further into it. The outcome was very typical – I made several standard-looking moves (although didn’t play 11.Bd2, which looks stronger than my 11.bc3), and started fighting for the equality from the move 13. Surprisingly, I managed to equalize! In the final position Black has many ideas, but neither seems to give him an edge. There is 25...Re3, of course, but both sides have reasons to hate this position: White has a weak king and poorly coordinated pieces, but Black plays without an exchange. Teimour Radjabov: I agree with Peter – after 11.bc3 Black has a comfortable game. I thought I could fight for the initiative, but didn’t find a proper moment for that. Of course, I examined 25...Re3 in the final position. The problem of this move is fairly obvious: Black is an exchange down, plus the a7-pawn needs attention. I didn’t find how to proceed. There are many ideas, but I couldn’t see how to implement them... To sum up: it was a fighting draw! Ernesto Inarkiev: I consciously went for an inferior ending, expecting to neutralize White’s advantage. However, I made a mistake somewhere, and my position became lost. Of course I was very lucky in the end. Inarkiev: Yes, but this victory wasn’t exactly what one can expect from a leader. Vladimir Akopian: Maybe I should have played calmer, but I didn’t consider the position around the 26th move to be dangerous for White. However, my assessment proved wrong, and I had to make many precise moves in order not to lose immediately. Still my position was much worse, but I made all the best moves and managed to make a draw. Shakhriyar Mamedyarov: I thought I was already winning after 26...Qc3, lost concentration and played 31...Bh6 being completely sure that I am winning a piece. However, White kept finding the only moves and somehow held the balance. After I took the pawn on f4 I suddenly saw that White can just take the bishop! The point is that on 37...Rc3 there is 38.Rc6! and 39.Nd5! I panicked – will I lose this game again?! Like in the second round, when I dominated against Gelfand, and then lost in a few moves. Then I calmed down and found the drawing line. There are nine more rounds to play, and I must change something in my play! One cannot show a decent result with so many blunders! Pavel Eljanov: My yesterday’s game was like a soap opera, and today it was a thriller. I think I had a big advantage after the opening; however, Vugar had some dynamic possibilities. His main idea was b6-b5, thus 19.b4. Maybe I had to prepare that move, because soon my pieces became rather shaky. Vugar made a very strong sequence: 22...Rc4, 23...Rc5, and White had to part with material. Still I didn’t overstep the line, and managed to defend in a complicated ending. After the 47th move neither side risked losing. Vugar Gashimov: And I think I had an advantage after the opening! 18...b5 with counterplay seems interesting, but I thought my advantage after 21...a5 is big enough. Pavel found a very interesting idea of sacrificing a piece for three pawns. After we traded the queens I expected to take the a4-pawn, but the opponent created his counterplay just in time and secured a draw. Wang Yue: I got lucky today. I didn’t like my position in the opening at all. The key defensive move was 18...Rfe8, aiming at controlling the e5-square. Later I think I managed to equalize. Yesterday’s game, in which I missed a win in one move, did not influence me at all. It all remained in the past. Peter Leko: It was an easy and pleasant game for me. 15...Bc5 is an interesting try, although it allows the 16.e6 break, which is considered the maximum White can achieve in this line. However, maximum can easily turn to a minimum in a single game. Ruslan is a good defender, and he handled his difficult position excellently. During the game I studied a ton of variations that seemed to give me an advantage, but in every case Black could defend with the best moves. Ruslan Ponomariov: Unlike Peter, I didn’t enjoy the game. I ended up in a tough position without any counterplay, and White could play for a win without risk. Fortunately I managed to defend, but I had to find many accurate moves.